Join our hands-on practical sushi making class with Sushi Made Simple cookbook author, Atsuko! Firstly you will make the proper sushi rice, then making your own sushi and sashimi! Join our hands-on practical sushi making class with Sushi Made Simple cookbook author, Atsuko! 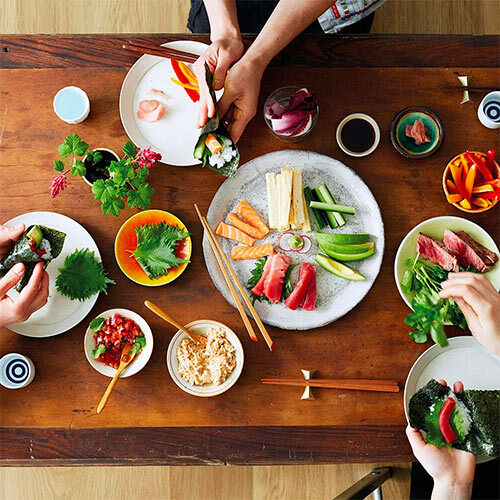 Firstly, you will learn how to make classic premium white sushi rice, then make your own rolled sushi with your favourite fillings such as salmon sashimi with avocado, spicy tuna with avocado or watercress with beef steak and wasabi! There is a plenty of creative styles of rolls you can learn in this session. One more fun for you would be making an egg omelette roll with using a square frying pan! We provide fine quality Japanese products and sashimi quality fish as always.